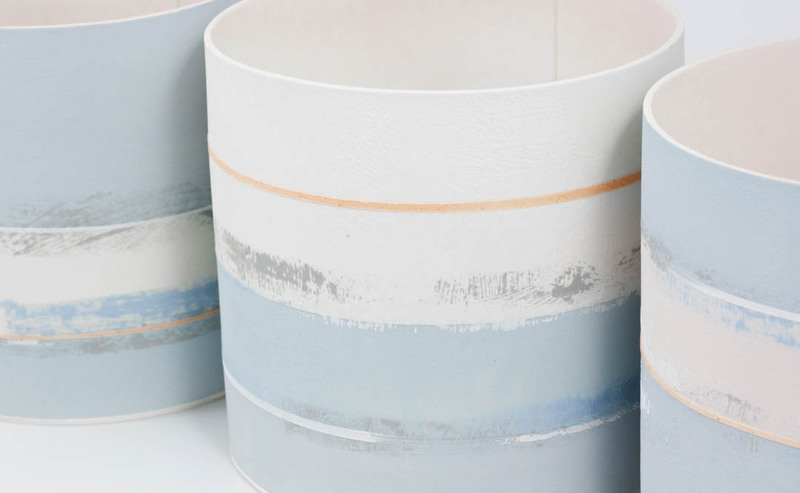 Rachel Foxwell makes process-based earthenware vessels utilising uniquely developed ceramic slips. Her work is a synthesis of expressive, intuitive surfaces and minimal forms. Each work is a painting that has form. Abstract compositions evolve through her tactile and contemplative painterly processes on clay canvas. Complex layers of slips and engobes (high clay slurries) are meticulously applied to thin clay slabs. The slabs are later assembled to create simple, geometric forms, marrying form and surface so they become one indivisible unit. Her current series of work juxtaposes the freedom of loose, textural mark making and the precise, controlling use of line. Working in series establishes a rhythm, and by making subtle variations to the surface decoration and the degrees of colour and texture integration the pieces have instinctively developed.